MassKara Festival is one of the most popular festival in the Philippines. This is the world renowned special event that Bacolod "The City of Smiles", in the Province of Negros Occidental is celebrating. MassKara festival is a Mardi Gras like celebration that masked and costumed street dancers, with fairs and carnivals. MassKara Festival is celebrated in the third weekend of October that is close to October 19. MassKara Festival is a week long celebration that kick off with mask-making contest, food fairs, brass band competitions, beauty and talent pageants, a windsurfing regatta, drinking and eating contests, trade fairs and exhibits. The highlight of the festivities is the Mardi-gras parade that the street dancers dance in the streets with beautiful design mask and colorful costumes in the Latin rhythms Rio de Janiero style. MassKara–a fusion of two words–the English word mass meaning “many” or “a multitude” and the Spanish workd kara which in English means “face”. MassKara is also mascarâ, the dialect for the English word mask. MassKara thus means a multitude of smiling faces. Smiling colorful masks set on headdresses of every imaginative design and color are worn by hundreds of dancers costumed in an explosion of hues as they stomp, pulsate and gyrate along the major streets of Bacolod every third weekend of October. 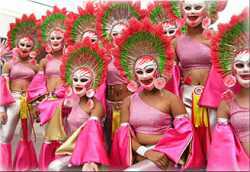 MassKara Festival is the biggest annual tourism event in the province that coincides with Bacolod City's Charter Day celebration. Sige Lang… Sige Na! 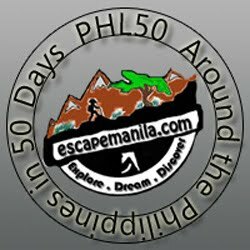 Bacolod, Batò Kita! This is the theme of the Masskara festival which reflects optimism of the Bacolodnons- that no matter how tough and bad the times were, Bacolod City is going to pull through, survive, and in the end, triumph. The festival first began in 1980 during a period of crisis. In the midst of the tragic events, the city's artists, local government and civic groups decided to hold a festival of smiles, because the city is also known as the City of Smiles. They reasoned that a festival was also a good opportunity to pull the residents out of the pervasive gloomy atmosphere. More important, the festival dramatizes the Negrenses’ fortitude and unsinkable spirit.